Weston Heflin is the go-to conversational voice for clients worldwide, including Chick-fil-A, HP, IBM, Sprint, BMW, Iams, PUMA, Planet Fitness, Adidas, Google, Hertz, Crayola, and more! His world-class voice overs are recorded within an ultra-quiet, acoustically treated, BRIGHT ORANGE WhisperRoom using a Neumann TLM 102 microphone and a Custom Built, High-Performance PC, for unmatched sound. The studio is also equipped with Skype, Source-Connect, ipDTL, phone patch, and ISDN, allowing you to direct from your location! 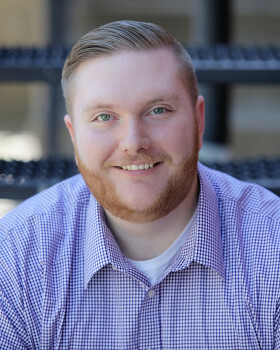 Weston Heflin is the go-to conversational voice for clients worldwide, including Chick-fil-A, HP, IBM, Sprint, BMW, Iams, PUMA, Planet Fitness, Adidas, Google, Hertz, Crayola, and many more! His world-class voice overs are recorded within an ultra-quiet, acoustically treated, BRIGHT ORANGE WhisperRoom using a Neumann TLM 102 microphone and a Custom Built, High-Performance PC, for unmatched sound. The studio is also equipped with Skype, Source-Connect, ipDTL, phone patch, and ISDN, allowing you the option of directing the session from your location! My clients keep coming back. Do I have an addictive personality? Maybe. Do I offer them too much free candy? Probably. Do they love the work I do? Abso-freaking-lutely! My clients know that they can trust me to get their jobs done flawlessly every time, and they count on me to get them their files on tight turnarounds. I mean, you know how it goes, right? You book a job with a client, and they're a pretty big deal. All of the sudden, they want it YESTERDAY and they want you to pay them for the honor doing business with them. So there you sit, confused, whip-lashed, and dissatisfied with the pizza you had for lunch. Here's where I come in. I swoop in, not unlike Ironman, and offer a sweet turnaround time with amazing reads and quality production. You think "man, this dude just saved my skin, and his voice is so seductive, this client will for sure pay me double, hey, maybe even triple!". Then you look back on your life 20 years later, as you are retired, sipping mimosas in Jamaica, thinking "wow, I'm super glad I hired Weston. I'm also glad to have such a great, cultivated, and on-going relationship with him." Then you look to your left and tell me that yourself, because we're good friends now and we've made a killing together, we've changed the media industry, heck, we ARE the media industry! Now, enjoy your mimosa, longtime friendship, and the sweet reggae. My commercial clients include Macallan Whisky (burns so good), Sprint (can you hear me now? ), BMW (vroom vroom), PUMA (meow), Adidas ("He's gonna be a soccer player! "), Arris (pwn newbs on CSGO), Domino's Pizza (Cowabunga dude), Crayola (remember the crayon boxes with sharpeners? ), Hewlett-Packard (the official computer of Oliver Queen, maybe), Labrada Nutrition (get ripped bruh! ), Planet Fitness (but don't forget your cardio! ), Home Depot (not Office Depot), Zebra Steel Pens (made from real Zebra! ), SAP (the German CPA friend you have), Western Union (WU! ), Storage West (this town not big enough for you? Try Storage West), Mohawk (dyed pink), Hydra Nutrition (Hail Hydra), Ford (let's go muddin') and tons of others. My corporate clients include Chick-fil-A, Jim Beam, University of British Colombia, KCI Industries, Marriott, IBM, NetApp, Koch Industries, INVISTA Sarl, Google, Hyundai, MedAssets, and many more. I am also proficient in several authentic accents such as Australian (put another shrimp on the Barbie! ), Estuary, Cockney (also known as the Orcs or bad guys), RP British, Yorkshire (think Jon Snow), Scottish, all US dialects, and Canadian, eh? Now for some real talk. I'm sure you're wondering why I called you here today. I'm starting a new initiative, you see, a secret initiative, and I want you in on the ground floor. Now I may be one the of most highly requested conversational voices in the world, and sure, maybe I can do sick videogame voices, deep gravelly whisky drinkin' kinda voices, and even one of the most smooth and authentic eLearning narratorions, but I need your help. I need your genius, your expertise, your brilliance! You see, you write scripts, and even if you don't I do! But you make the sick videos! And that I don't do. So what do we do? We work together, to change the way the world views the rest of the world. With a simple pan of the camera, change of voice inflection, and turn in music, we influence MILLIONS. We create the inspired. We create the hopeful. We. Are. The inspirizers!! No?.. hmm... How about the hope-fillers. I know, I know, I can hear you sighing over the internet. We can figure that out later. My point is with my sultry, powerful, conversational, authentic, real, inspiring voice, copywriting, casting, and production services combined with your otherworldly video, client finding, or editing skills we can own this town AND make this town big enough for two people (no more gun fights and dead cowboys). If you want your voice-over done by a professionally seasoned (mmm steak) voice ACTOR that is interested in your project and your client, we should work together. Seriously, I've spent years and 10s of thousands of hours perfecting my craft in acting and several authentic accents, and I would love to collaborate with you to create something that pulls on the hearts strings of others around the world. I have everything you need to complete a successful VO project, and hey! If I don't I know plenty of people who do, and I can connect you to them. This is a team effort, and I am a team player. So let's all win this game and go drink some capris suns and eat rice crispy treats. Accents: General US, New England, Midwest, Southern, Dixie/Delta, California, Surfer, Scottish, Australian, Russian, British-RP, Yorkshire, Estuary, German, General Irish, and Jamaican. VOICE STYLE/TYPE Weston’s voice over type has been described as likeable, friendly, genuine, authentic, believable, guy next door, high-energy, soft sell, hard sell, sincere, cool, corporate, professional, pleasing, soothing, relatable, sophisticated, knowledgeable, promo, urgent, and educational. He has been cast for a wide range of age requirements . . . male teens, 20's, 30's, and 40's. His style could be closely compared to Tim Allen, George Clooney, Mike Rowe, and Ben Stiller. PERFORMANCE CAPABILITES Believable is the first word that comes to most client’s minds when describing Weston’s voice. Friendly, Conversational, Believable, Professional, Confident, Informative, Authoritative, Animated, Upbeat, Coporate, Sincere, Powerful, Energetic, and Relatable are also accurate adjectives. Whether your need is a voice over for a commercial, white-board animation, corporate narration, video, e-learning, explainer video, training video, internet video, tv project, educational script, IVR prompts, on-hold message, tutorial, direct response ad (DR), talking toy, GPS (SatNav), medical, technical, legal, mobile app (android or ios), radio imaging, or high powered promo . . . Weston can provide it all. BUSINESS PHILOSOPHY Weston believes in treating clients like partners. Working together should be as easy as if you were working together in the same office. Communication is frequent and work is completed promptly (often same day) so you never have to guess the progress of your project or worry if it will be completed on time. STUDIO AND AUDIO Voice over is more than a great read. Demanding clients expect high quality, pristine audio, and that is precisely what you can expect. Voice overs are recorded within an ultra-quiet, acoustically treated custom built WhisperRoom using a Neumann TLM 102 microphone and a Custom Built, High-Performance PC, for world class sound. The studio is also equipped with Skype and phone patch allowing you the option of directing the session from your location. Marc Graue - Video Game Intensive - One-on-One Training included developing acting skills, accents, voice placement, and character creation. Teacher's credits: World of Warcraft, Grand Theft Auto V, Avatar: The Last Airbender, Fallout: New Vegas. David Tom - Acting - One-on-One Training involved scene work, monologues, and personalization training. Teacher's credits: NCIS, The Young and The Restless, Criminal Minds, Supernatural. J. Michael Collins Training in commercials, conversational speech, and professional narration. Teacher's credits:Disney, McDonald's, Sony, Nike.